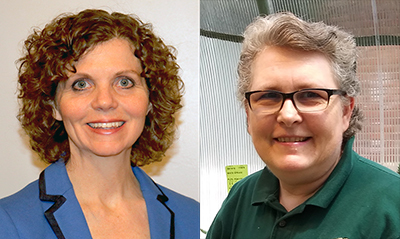 Annapolis, MD; April 3, 2019—Therese Poland, Ph.D., and Melody Keena, Ph.D., research entomologists at the USDA Forest Service, will be the new co-editors-in-chief of the journal Environmental Entomology, published by the Entomological Society of America. Therese Poland, Ph.D., and Melody Keena, Ph.D. The ESA Governing Board has approved Poland and Keena's appointment to succeed Alan Cameron, Ph.D., professor emeritus of entomology at Penn State University, who retired as editor-in-chief after a distinguished term of service at the end of 2018. Kevin Heinz, professor of entomology at Texas A&M University, has served as interim editor-in-chief since Cameron's retirement. The Environmental Entomology Editorial Board launched an open search for Cameron's successor in November 2018. "Dr. Poland and Dr. Keena are leaders in their field, and their dedication to advancing scientific understanding of the roles and interactions of insects in our ecosystems is hard to match," says ESA President Bob Peterson, Ph.D. "My colleagues and I on the ESA Governing Board are excited to see Therese and Melody take the journal to new levels of success and build on the strong foundation set by Dr. Alan Cameron." Poland and Keena each bring multiple decades of experience in entomology to their role. Poland has served the Forest Service's Northern Research Station at its laboratory in East Lansing, Michigan, since 1997, and Keena joined the same Forest Service division at its Hamden, Connecticut, center in 1992. Their work has regularly put them on the front lines of researching the ecology and environmental impacts of invasive insect species. "My fellow members of the Environmental Entomology Editorial Board and I are pleased to welcome Dr. Poland and Dr. Keena as the journal's next editors-in-chief. Therese and Melody have been dedicated contributors to the journal and field for many years, and their lengthy track record of leadership and collaboration will serve them well in engaging the entomological research community," says Barry Alto, Ph.D., associate professor of entomology at the University of Florida and chair of the Environmental Entomology Editorial Board's search committee. "We also must sincerely thank Dr. Alan Cameron for his incredible service and dedication in leading Environmental Entomology to its current heights," Alto says. Poland and Keena will take on a four-year term as Environmental Entomology co-editors-in-chief. "I am honored to begin serving as co-editor-in-chief of Environmental Entomology. It was the first journal I subscribed to as a graduate student and is a primary reference source for my research," Poland says. "I am looking forward to serving the Society in this exciting and challenging role." As they step into their leadership role with Environmental Entomology, Poland and Keena have outlined four goals for the journal: increasing its impact factor; increasing readership; maintaining a rapid, high-quality review process; and making reviewing for the journal a desirable, rewarding experience for fellow scientists. "I am honored to be selected as one of the two new co-editors-in-chief for Environmental Entomology and humbled by the task of following in the footsteps of Dr. Cameron," Keena says. "The ESA journals are an integral part of our profession's global influence, and this journal has been an outlet for much of the research I conduct on invasive forest insects." Poland's career in entomological research has focused on chemical ecology, host resistance and interactions, insecticidal and cultural control, and insect phenology and behavior, among other subjects. She began her professional career in entomology at Phero-Tech, Inc., in British Columbia, Canada, before joining the USDA Forest Service in 1997 as a post-doctoral research entomologist, where she has risen through the ranks to her current role, project leader and research entomologist, which she started in 2015. Poland has served in several editorial roles for scientific societies and publications, including editor of The Great Lakes Entomologist from 2002 to 2015. She has also served as an adjunct associate professor in the Department of Entomology at Michigan State University since 2001. Poland has been a member of ESA since 1992, and she holds three degrees from Simon Fraser University: B.S. in biological sciences (1989), M.P.M. in pest management (1993) and Ph.D. in biological sciences (1997). Keena has studied and published research on subjects including pesticide resistance management, population genetics, biological control, molecular evolution, microbial pesticides, phenology, behavior, and insect rearing. Her career in entomology began as a post-graduate researcher at the University of California, Davis, in 1988. In 1989, she moved to the position of research associate at the University of Connecticut, and she joined the USDA Forest Service as a research entomologist in 1992. Today, she is a research entomologist and director's representative, a role she started in 2007. Keena has been a member of ESA since 1983 and has served in multiple volunteer roles in the Society, including member of the ESA Governing Board from 2009 to 2011. She holds three degrees from the University of California, Davis: B.S. (1983), M.S. (1985), and Ph.D. (1988), all in entomology. ABOUT: ESA is the largest organization in the world serving the professional and scientific needs of entomologists and people in related disciplines. Founded in 1889, ESA today has more than 7,000 members affiliated with educational institutions, health agencies, private industry, and government. Headquartered in Annapolis, Maryland, the Society stands ready as a non-partisan scientific and educational resource for all insect-related topics. For more information, visit www.entsoc.org. 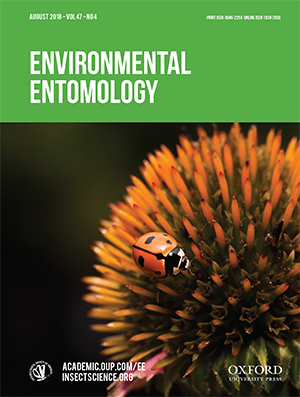 Environmental Entomology publishes reports on the interaction of insects with the biological, chemical, and physical aspects of their environment. For more information, visit https://academic.oup.com/ee, or visit www.insectscience.org to view the full portfolio of ESA journals and publications.